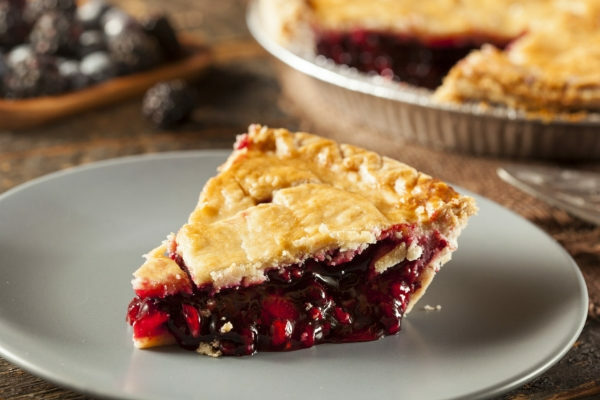 Some of the best holiday memories are spent in the kitchen baking your favorite recipes with friends and family, which is why we’ve put together a delicious holiday pie recipe that incorporates our Chardonnay in the crust, and our Red Blend in the berry filling! Combine the flour and salt in a large mixing bowl. Mix well. Add shortening and use a fork or your hands to mix it until it is crumbly. Note: Don’t overmix it. Big crumbs are ok. In a smaller mixing bowl, add the egg and AVA Grace chilled Chardonnay. Whisk until completely combined and frothy/bubbly. Add apple cider vinegar to the smaller bowl. Stir once. Pour the liquid into the flour mixture. Let sit for one minute and then mix until a dough forms. Once you have a workable dough, divide the dough evenly into two separate balls. Cover in plastic wrap and chill in the fridge for an hour (or the freezer for half that time). Add frozen mixed berries to a microwave safe bowl and microwave for two minutes. Take them out and stir them and then place them in for another minute. Then put them in the fridge to chill. Combine the sugar, cinnamon, nutmeg, and corn starch in a medium saucepan (not heated) until thoroughly combined. Put the saucepan on medium heat and pour the Red Blend into the dry ingredients. Stir constantly until it thickens to the consistency of honey. Once at this point, add the honey and stir until well-combined, thick, and sticky. Take the saucepan off heat and put the mixture in a bowl. Cover it and chill in the fridge. Take one of the balls of dough and roll it out on a floured piece of parchment paper until it is shaped like a circle and then transfer it to your pie dish. Press down the dough so that there are no air bubbles. Place the pie dish and dough in the freezer to keep chilled for 10-15 minutes. Note: Lightly fold your pie dough in half and then into quarters for easy transfer to the pie dish. Roll out the remaining ball of dough and place back in the freezer until you are ready to place it on the pie (step 4). 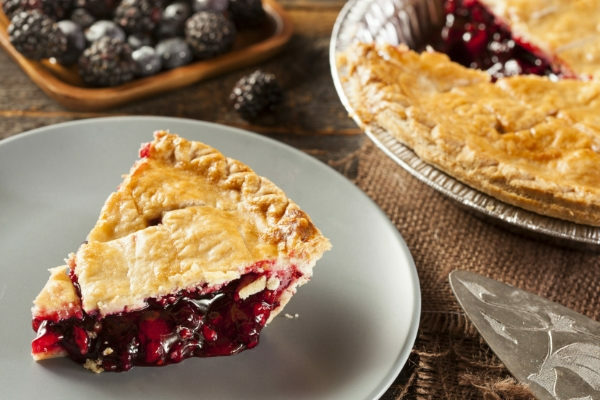 Take the red wine and sugar mixture and the berries out of the refrigerator and take the bottom pie crust out of the freezer. Combine them in the pie dish. Take the top dough out of the freezer and place on top of the pie. Pinch the edges. Brush with milk and sprinkle with granulated sugar. Cut slits in the middle of the top dough so that air can escape. Place the pie in the oven at 400 degrees for 20 minutes. After 20 minutes lower the temperature to 350 (without opening the oven) and bake for another 20 to 30 minutes or until golden brown. Enjoy with whipped cream and a glass of Red Blend.